At first Gene wondered why the sign doesn't have Spanish in a more prominent position. Then he realized that the (non-English) languages are in alphabetical order according to their English names: Chinese, Hindi, Japanese, Khmer, Korean, Spanish, Tagalog, Thai, Vietnamese. He was also briefly puzzled about why what he thought was "Cambodian" was out of order, since that's the default name he has for that language. Inasmuch as we have been speaking of the Sinosphere, Gene remarked that 投票 is used in Chinese (tóupiào) and Japanese (tōhyō). Reading from left to right, the first two composite symbols are "t'u p'yo" (Chin. toupiao). The next symbol is "ha", the root form of the verb "hada", which means "to do" but is used, like "suru" in Japanese, to make a verb out of a noun. The next symbol "nun" is a verbal affix (don't worry about it). The fifth symbol "kos" (the "s" is pronounced like a "t" here) means "place." Symbols 3-5 are all indigenous Korean. Of the three words (Bầu tại đây) on the Vietnamese part of the sign, the only one that can definitely be written with a Chinese character is the one in the middle: "tại." This is "在," "at, located at." There is some chance that "bầu" "to cast, throw" has some sort of primordial relationship to Chinese "拋," (pao, 1st tone), which means "to cast or throw," but it is not a word that most Vietnamese would recognize as being of Chinese origin. The third word, "đây," is a word of purely indigenous origin meaning "here." The Chinese is almost the same as on the sign in Los Angeles, but consists of four characters (zài cǐ tóupiào 在此投票 [lit., "at here vote"]) instead of five (zài cǐ chù tóupiào 在此處投票 ["at this place vote"]). "여기서 투표하십시오" comes out as "Yeogiseo t'up'yo hashipshio." The spelling "eo" stands for a vowel sound like "-aw" in "saw." "Sh" would be just "s" in both cases if I were to transliterate strictly, but the sound is more like "sh," so I thought it would conduce to a better sound to use "sh." "Yeogi" (여기) means "here." The suffix "seo" (서) means that an action is going to take place at the location indicated by "yeogi." "T'up'yo is Sino-Korean for "投票." "Hashipshio" (하십시오) is a form of the verb "hada" (하다), "to do." In Korean, it is necessary to add "hada" to Chinese verb-object compounds in order to give them verbal force in a sentence. The form of "hada" used here ("hashipshio") is gently imperative, so the whole sentence means something like "Go ahead and cast your ballots here." Thus, just from this short notice to "vote here", for Japanese, Korean, and Vietnamese — presumably all members of the "Sinosphere" — we see that the nature of Sinitic influence in each differs markedly. Perhaps readers will comment on the Khmer, Tagalog, and Thai versions with regard to the Indosphere vs. Sinosphere divide. "此處" to me rings Cantonese, which makes sense for California. The instructions for voting must be printed in a language when the proportion of the population in an area reaches a certain percentage. Whatever it is, in Chicago they started printing voting instructions in Chinese (traditional characters) after the 2000 census showed that Chinese speakers/readers had surpassed that required level. The Tagalog version "Dito bumoto" doesn't seem to belong to either the Sino- or the Indosphere, as far as I can tell. "Dito" means "here", and I would guess it's indigenous. "Bumoto" contains the infix -um-, which makes it a verb. The stem "boto" is a loan from Spanish (according to my dictionary; I thought there was a 50/50 chance that it came from English or Spanish). I'm a bit taken aback by the Japanese, though I'm sure that in CA someone must have checked with a native. It's not incorrect by any means, but strikes me as unnatural. Japanese tends to exclusively use single nominal phrases in such cases: 投票所 (polling place; tōhyōjo) would have been my #1 guess. 投票はここ is a bit more literal than I would have expected, though it better parallels the English and is "softer" and less imposing. How do the native speakers out there feel about this? Bumoto is indeed from Spanish "voto." As you may expect, the English "vote" is also used. But I normally hear it with the mag- prefix rather than the -um- infix. I think it's because the former is more productive than the latter. I notice, that "dito" (here) is fronted – so word-for-word it says "Here vote." Normally prepositional phases are found after the verb, but the translation used is totally fine. Furthermore, if you are indicating to someone the way to go (“this [here] way”), I think it would almost always be こちら (kochira). If it is a finger pointing to a spot, ここ (koko) would be OK (for something like “Deposit your garbage here” with a sign pointing down to the garbage can opening). Still, for this public, official sign, こちら (kochira) would be the way to go! I will be in Japan next week. I’ll look for some examples! On the post-election edition of the Colbert Report, Stephen Colbert (in his guise as a Bill O'Reilly type) complained that there were signs at polling places telling Hispanics to vote for someone named Aqui. I'm not a native speaker, or even fluent, but the Tagalog version sounds slightly off to me. I read it as saying "(People) from here have voted" rather than "Vote (in) here", which I'd render as "Boto kayo nandito". OTOH, it may be a compromise to have it fit legibly within the available space. Correctness aside, "bumoto" is a good example of a borrowing being thoroughly assimilated into Tagalog, with the same affixes as a native word could have. @Chris: So the Philippines is technically an hypersphere? The Civil Rights division of the DOJ (link here) publishes a list of which minority groups must have voting materials provided for them in various districts across the country. The list is by group, not by language, which might cause ambiguity in some cases, eg between Mandarin and Cantonese. 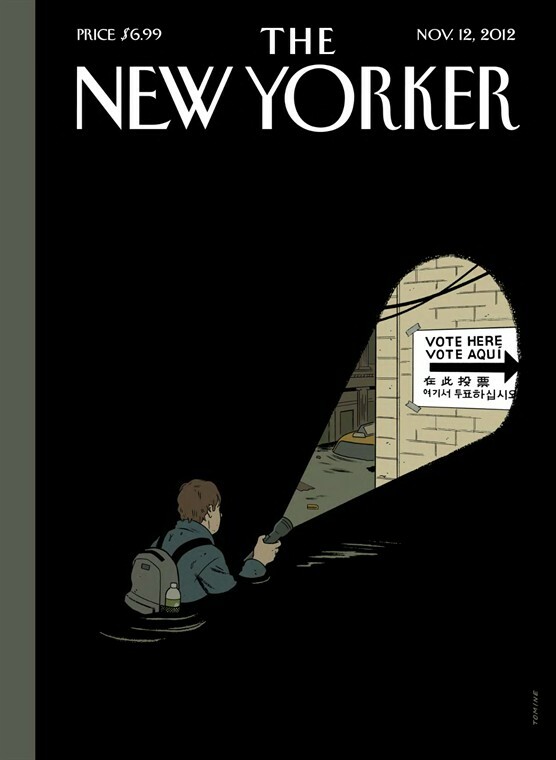 The New Yorker cover is presumably set in Queens County, which is the only place in New York where Korean is required. But "Asian Indian" (Hindi?) is also required there. The list in Los Angeles County is: Asian Indian, Chinese, Filipino, Hispanic, Japanese, Korean, "Other Asian — not specified", and Vietnamese. Presumably Cambodian people come under "other Asian not specified." And the criterion for a language is: at least 10,000 of the voters in a jurisdiction, or at least 5%, must be "members of a single-language minority group" who don't "speak or understand English well enough to participate in the electoral process". "The list is by group, not by language, which might cause ambiguity in some cases, e.g., between Mandarin and Cantonese." Excellent, essential point! I will have more to say about his exact matter later on. @Pau Amma: As a native speaker, I think it sounds ok. Though I probably prefer "bumoto kayo rito" or simply "bumoto rito." Your translation of "boto kayo nandito" is incorrect because "nandito" means "to be here" so you have to take the "nan." Other than, it's good. I don't know what signs – if any – they use in the Philippines, since I never voted there. I gather "dito" and "rito" both mean "here" in Tagalog. Both are very close to "nido" in Chinese Cantonese which means "here". Would "dito" "rito" "nido", all meaning "here", be originally the same word? In Austronesian? (Sorry I don't have a book on language families at hand.) I think Cantonese originally was an Austronesian language which later absorbed a huge vocabulary from the Sinitic language. @julie lee Yes, you're correct that dito/rito means "here" in Tagalog. I should point out that there is also "nito" in Tagalog, which is the genitive form (i.e., "of this"). Though, I doubt that it's the same word as Cantonese "nidou." AFAIK, Cantonese is a Sino-Tibetan language (like Mandarin, et. al.). So it's probably just a coincidence. By the way, Austronesian historical linguist Bob Blust reconstructs Tagalog "dito" as coming from Proto Western Malayo-Polynesian *di-Cu. While Austronesian historical linguist John Wolff reconstructs it as *di-tu. The *di in both is a preposition while *Cu & *tu mean "that." What's interesting in that in many Austronesian languages, reflexes of this form mean "this" or "here" while in Tagalog it means "that" or "there." Quite confusing for me as a Tagalog speaker taking a beginning course on Indonesian! Agree with Christ Sundita that "As for the sphere – the Philippines has been shaped by the Sinosphere, Hispanosphere, Anglosphere, and the Islamosphere (in the south)"– not to mention Malaysian/Indonesian, and I suspect, at some level, Khmer. There are also some Indian words such as "guru". The names of the people commenting on Tagalog on the blog is telling. I am preparing a separate post on the Cantonese word for "here" that will clarify these issues. Meanwhile, thanks for your valuable information on Austronesian. It's intriguing that the-word-written-in-hanzi-as-投票 appears in so many of the "Sinographospheric" languages, because I wouldn't have expected it to be a particularly old word. In the 日本国語大辞典's definition of the word, the oldest attestation is in 1874 (in the "広益熟字典"). The entry also notes that before "tōhyō", a word written 入札 and pronounced "irefuda" (native Japanese) or "nyūsatsu" (Sino-Japanese) — and that there was an overlapping period where, for example, people would write 投票 with the furigana (indicated reading) "irefuda". The word "tōhyō" didn't make it into Hepburn's J-E dictionary until the third edition (1886), apparently. There is no information about possible continental antecedents to the word. Is there any interesting information on the Chinese or Korean side about the origins of "tóupiào"/"t'up'yo"? "Asian Indian" may mean different things in different jurisdictions, because in New York City there were some VOTE HERE signs in Bengali (or so I am told by friends who unlike me are literate in Bengali and presumably would not confuse it with Hindi or anything else?). I've got a lot of information about the history of TOUPIAO ("vote") in the Sinosphere, and will write a separate blog on that too. @Victor Looking forward to your blog posts on the subjects of 投票 and Cantonese "here". Somewhat more humorously: in San Francisco we have signs like this one that prohibit electioneering within 100 feet — or, in Spanish, 100 pies – of a polling place. 투표소 (vote + station) seems like the official notation in Korea. I couldn't find any info on the etymology of the word in Korean, except that it's Hanja. There's a possibility that the word came via the Japanese during the occupation, but I doubt it. @Michael Lugo, doesn't "pie" mean "foot" in both senses — the thing at the end of your leg as well as 12 inches? re in Tagalog NITO means "of this". In Cantonese, NIDI means "these". Though Cantonese historically is a Yue (Viet) language, which suggests it is Vietic, or an Austro-Asiatic language. Andy Averill's link to the official list of covered jurisdictions by "language minority" also reveals something called "Asian (Bangladeshi)" in Hamtramck, Michigan. In isolation, that could just be an odd way of referring to Bengali, but the underlying census bureau list, which is Out There (google "Statistical Modeling Methodology for the Voting Rights Act Section 203 Language Assistance Determinations") includes such even-more-bizarre "language minority groups" (none of which appear to have the right numbers in the right locality as to be entitled to section 203 status) as "Malaysian," "Pakistani," and "Sri Lankan" (! – on that last one one might want to briefly consider the salience of linguistic differences to the last few decades of violent and unhappy Sri Lankan history). The only "Asian" group listed that is not defined by nation-state is the Hmong. The handling of indigenous North American languages isn't much better – some counties in the Southwest are supposed to provide section 203 assistance to the "American Indian (Pueblo)" language minority, despite the fact that as I understand it there is no such thing as a "Pueblo" language, or even dialect chain, only a bunch of not-at-all-closely-related-genetically languages with some (according to wikipedia, this is not my area of expertise) Sprachbund/areal similarities. Similarly (although it's not numerous enough to be covered in any jurisdiction) the census people think there's a single "Tlingit-Haida" language minority group, which presumably flows from the fact that for federal-Indian-law purposes there has been since the 1930's a single political entity called the "Central Council of Tlingit and Haida Tribes of Alaska" despite the lack of any similarity between the Tlingit and Haida languages. FWIW, section 203(e) provides that "the term 'language minorities' or 'language minority group' means persons who are American Indian, Asian American, Alaska Native, or of Spanish heritage." 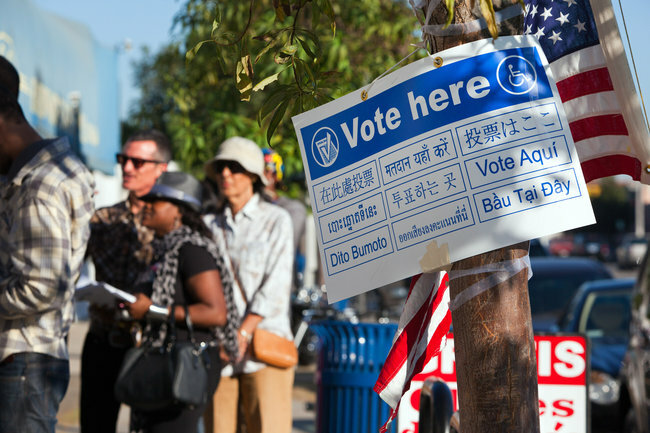 So the view of the law, for good or for ill, is that at least for purposes of participating in the electoral process limited English proficiency is a total non-issue among the country's non-Hispanic white, non-Hispanic black, and Pacific Islander populations, explaining the lack of any section 203 coverage for e.g. Russian, Haitian Kreol, or Samoan. Interestingly, it uses two synonymous (or near-synonymous) verb-object phrases, each of which consists of a native Tai verb plus a noun with a non-Tai source. /sǐaŋ/ is cognate with Chinese 聲 *l̥eŋ/syeng/shēng (Old Chinese/Middle Chinese/Mandarin) 'sound', /khanɛɛn/ looks like a Khmer borrowing, although I don't have the resources at the moment for an exact citation. Maybe some Thai speakers can weigh in on the differences in flavor between /ɔ̀ɔk sǐaŋ/ and /loŋ khanɛɛn/. Or is the second expression added to remove the ambiguity of 'pronounce' vs 'vote'? @Andy Averill: it does, and the translation is fine. Translators sometimes go metric in movie subtitles, news articles and similar genres, since most Spanish speakers across the world live in areas where the metric system is used, but in this case there'd be no reason to. /bɑh/ < (Old Khmer poḥ ~ pas) is attested in pre-Angkorian inscriptions (6th century CE). Headley claims /cnaot/ is a borrowing from Cham čhanut, while Jenner's dissertation suggests it may be a derivation from /caot/ 'to draw lots' (Headley lists this as ចាប់ឆ្នោត /cap cnaot/, /cap/ 'to seize, get, receive'; cognate w/Vietnamese chụp?). /nih/ < Old Khmer neh 'this, these'; /tii/ < Old Khmer di: 'place'; also borrowed into Thai. @David: คะแนน doesn't have any Khmer etymology as far as I know (which admittedly isn't that far).